“Kubota’s new HST Plus offers professional and novice users maximum HST performance by giving optimal control of both the hydraulic pump and the drive motor, all with simple operation,” he says. He adds that the Kubota L45 TLB not only has the muscle one needs for almost any job but its advanced technologies provide the versatility that is required in the segments in which this machine operates. But the L45 was not built only for power and versatility; it was also designed to be comfortable for the operator. In line with Kubota’s obsession with the fact that a comfortable operator is a productive one, it has increased the width between the fenders on the L45 by nearly 75mm and has used some of that room to add arm rests! 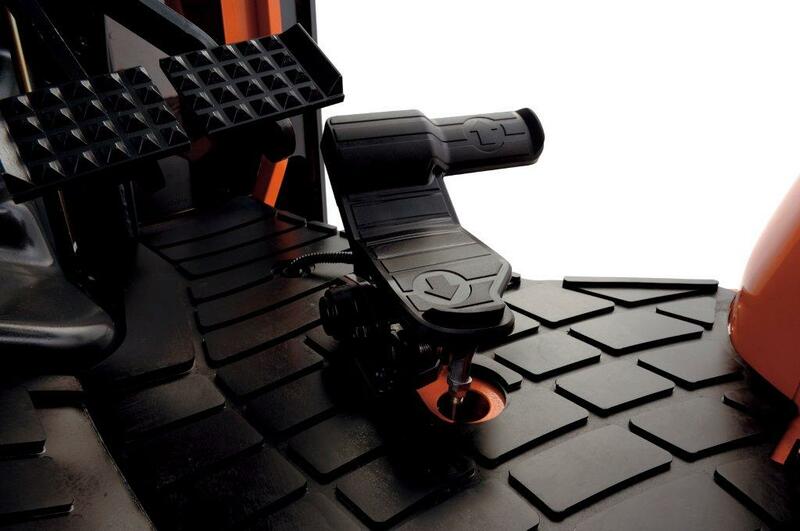 The L45 also features a full flat deck for easy mounting and dismounting, as well as the always easy-to-read Intellipanel®. In addition the L45’s distinctive slant new hood design is not just for good looks. 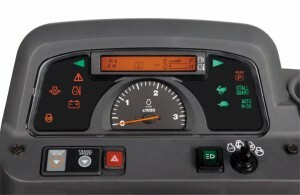 This unique styling offers the operator a greater field of view, allowing him/her to see more of what is in front of them. Importantly with a machine that has so many functions, the hydraulic engineering is all-important. All hydraulic hoses are routed through the boom and arm for improved hose protection and durability – not to mention the improved visibility! With the L45’s HST Plus transmission its heavy duty backhoe operates more effectively than ever and combining the HST Plus with the new backhoe crawling mode significantly increases productivity. 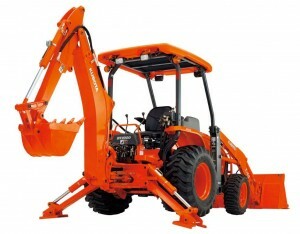 The backhoe has a 3m digging depth, a standard hydraulic thumb and a high-performance inching valve. Also, the optional quick coupler helps to change buckets in a “snap”. This is the perfect option for those who do a lot a bucket work and frequently change bucket types. Excellent operation, better visibility, and superior versatility are just some of the reasons the L45’s performance-matched loader is considered unrivalled for power and productivity. 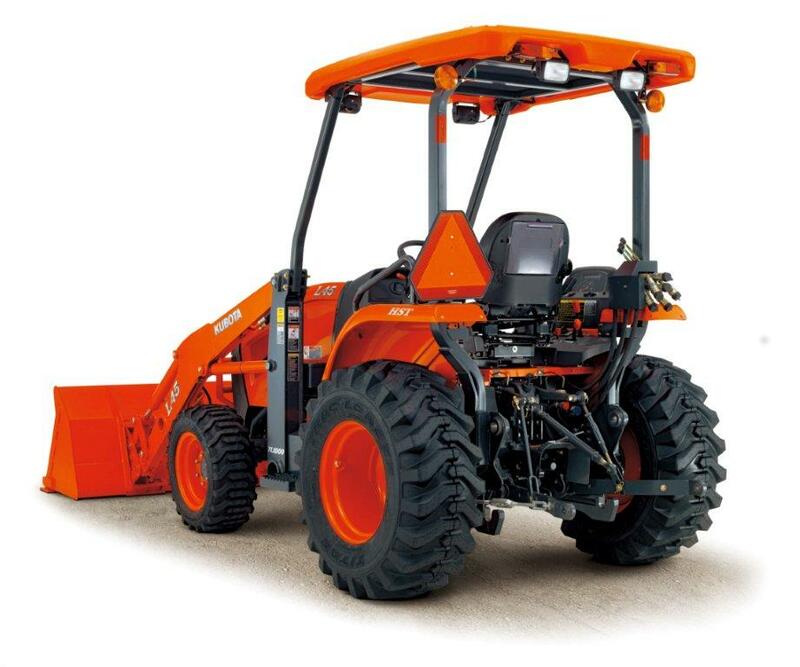 With a 1600kg of breakout force, 1000kg of lift capacity and a 2.8m lift-height, these robust loaders have the strength and reach for most projects. 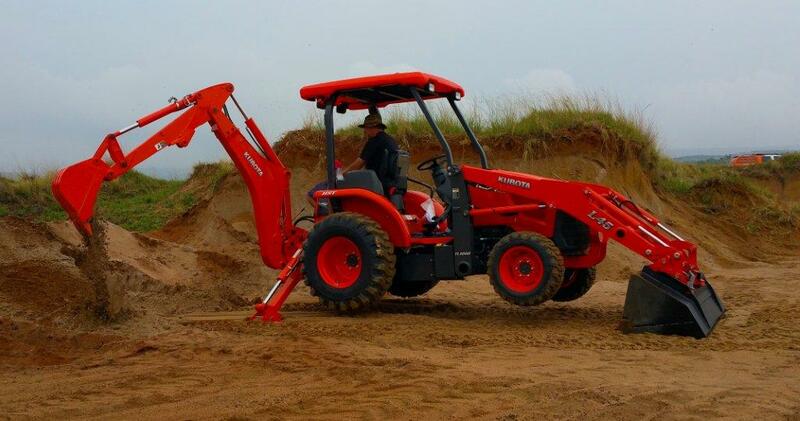 An important feature when using the front loader is the slanted boom which matches the L45’s hood and provides operators with a greater field view when changing attachments. The quick coupler is real operational boon. It is simple to use and no tools are required for easy on/off buckets, pallet forks etc. The L45’s independent PTO allows you to engage and disengage the rear PTO while the tractor is in motion. 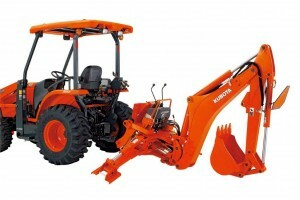 This means there is no need to stop the tractor to engage or disengage the rear PTO ensuring the enormously high productivity levels that Kubota has become famous for. 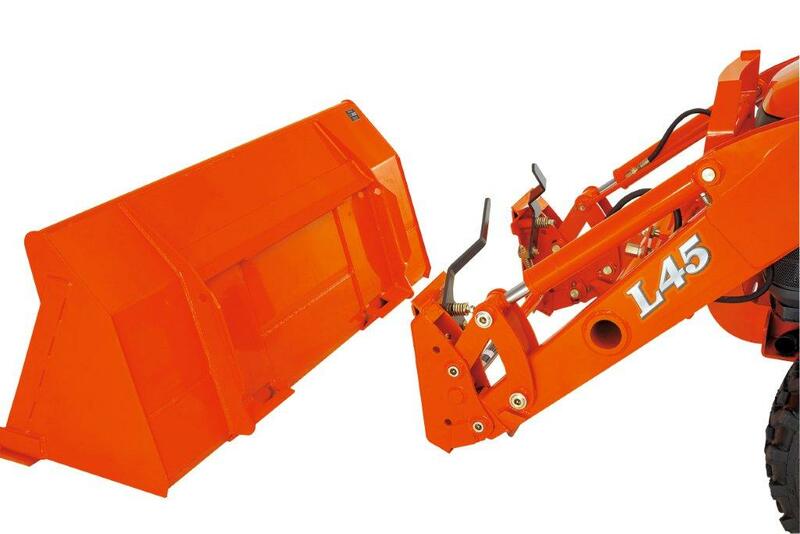 Also, for safer and more convenient PTO use, the L45 features an auto shut-off and protective slip-up shields. 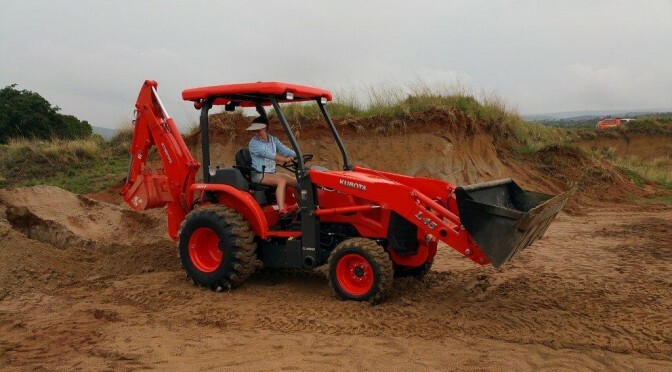 Users all over the world have described the experience of greater power, dependability and cleaner emissions with the 45hp Kubota diesel engine. It starts quickly in cold weather and sustains high torque rise, even under heavy loads or at lower speeds. Special balancers provide lower noise and vibration levels and a spark arrestor muffler is standard equipment. Heavy-duty rear axle uses multiple wet disc brakes for extended life and smooth stopping performance. Engelke says that this is one of the finest products in the Kubota range and that the market has responded positively. “This incredible TLB is an efficient and reliable machine which makes jobs easy and in the long run cheaper. Ultimately it’s the lifetime cost and efficiency of the machine that really counts and you cannot go wrong with the L45,” he concluded. Download the Kubota L45 Full Brochure. This article was released in the Landbouweekblad – 6 Mei 2016. This article was featured in the FarmTech – March April 2016. This article was featured in the HireSA – March 2016. This article was featured in the KZN Industrial and Business News – March 2016. This article was featured in the AgriSA – Feb Mar 2016. This article was featured in GRAAN SA – April 2016. This aricle was featured in the Capital News Equipment – May 2016.